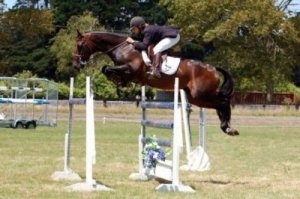 Standing resident stallion "Mighty Heights", an Advanced eventer and Grand Prix (1.60m) show jumper with an exceptional reputation for consistently producing talented horses with willing, easy-going natures. Vacancies for Schooling and Breaking-In your four legged friend now! Karen Teague, Grand Prix show jump rider and advanced eventer has had more than 20 years experience riding at top level. Having produced many horses that have reached top level in both New Zealand and overseas the team at Brookby Heights now pride themselves in their ability to continually produce genuine, willing horses of exceptional talent. From fun confidence building versatile horses to put someone's love back in to riding through to serious competitors to bring home the money we have an excellent reputation in matching horse to rider. Many people hit a wall in training their horses. Whether you are stumbling to get them to understand the next step in their training or you have encountered problems such as bucking, rearing, bolting or refusing to jump, we love to help. With a complete approach we quickly determine what is causing the behaviour and get to work. At the end we welcome you to come have a lesson on your "new" horse and are available for continuing support. Many of the horses we produce and train are sold overseas. We are a short 20 minute drive from New Zealand's biggest airport, Auckland City Airport. We also offer a pre-export facility and are experienced in managing all aspects of export from pre-quarantine requirements through to air travel. I just wanted to write to say thank you and how privileged we feel to be the owners of a Mighty Heights horse. The transition from ponies to hacks can sometimes be quite problematic. The amazing nature of the Mighty Heights progeny and the training you have put into them has made this transition for my daughter not only seamless but an absolute delight. It has completely rebuilt her confidence and reignited her passion; something I am eternally grateful for. Sue Dunmore, Auckland, New Zealand.